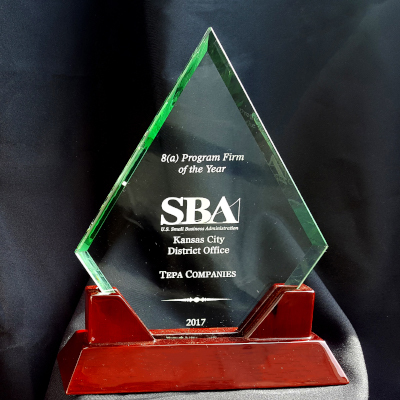 Three Tepa Companies were named the combined 2017 8(a) Business Development Program Company of the Year by the Small Business Administration (SBA), Kansas City District. Medvolt, Tehama and Tukuh Technologies were honored with the award after securing a combined $100 million-plus worth of federal contracts during fiscal year 2016 with the support of the SBA. The three Tepa Companies were chosen from more than 40 8(a) companies across 89 counties in Missouri and Kansas. Tepa received a National Safety Council (NSC) Occupational Excellence Achievement Award in 2017 for maintaining injury and illness records better than or equal to 50% of the Bureau of Labor Statistics for their North American Industry Classification System (NAICS) code. Tepa received a National Safety Council (NSC) Safety Leadership Award in 2017 for five straight years of no occupational injuries or illnesses that required employees to be away from work. Tepa received a National Safety Council (NSC) Perfect Record Award in 2016 for reaching 12 months without an occupational injury, illness or death.